Born in 1916 in Co. Durham. Describes leaving school at 14 and going to London to work at a private boys school. Mentions that Richard Dimbleby was there at the same time as a border. Describes how she only found this out when he died. Describes being a scullery maid in the kitchen and starting at the bottom. Describes how she had to get up very early and scrub the steps at the front of the building at 6.30 a.m. and it was dark. Describes how she had to clean two great big sinks and wash the dishes. There were machines to scrub the potatoes. Describes how she had probably washed RD's plates and prepared his vegetables. Describes how she was very homesick. Describes how she was friendly with the cook who was due to retire and mentioned that she (Doris) had always wanted to be a children's nurse and could picture herself walking through a park pushing a pram and wearing a cloak but she was too young.. Describes how cook said that Doris was "too refined for the kitchen". When the cook left at Christmas she indicated that she would keep in touch. Doris describes that she also left and returned to Co. Durham. Describes how the cook eventually found her job at Battersea Polytechnic as a kitchen maid. Describes the polytechnic being on Clapham Common. Describes how she was only going to stay a few months but stayed for 5 years. Describes how the students were in three houses and how they were amalgamated into one large house overlooking Clapham Common and she had to help cook for 130 student and the domestic staff. Describes how the cook again left and then sent for her and she became Assistant Cook at Belstead School in Aldeburgh in 1936. Describes how she 'lived in' at Belstead. Describes Belstead as being a girls school, the headmistress being a Miss Barnes, the school was situated in Park Road on the left and Doris could still see her bedroom window. Doris tried to remember the name of the lady who owned the school but could not bring it to mind. Describes how the name could be found in Aldeburgh Church, where she thought there was either a plaque or a window with her name on it. Describes how she was very happy at Belstead School and received a wage of £1.00 a week as opposed to 15/- in London. Track 2 [9 mins] Describes how there were 90 people to cook for. Describes how the girls were all borders and remembers one girl as being Susan Barclay, probably of Barclays Bank. Describes a boys school along the sea front (Crespigny House?) now flats, and then describes the bathing huts on the beach. Describes how Mr. Cable built a raft out on the sea so that he could watch the bathers, like a lifeguard. Describes how she met her husband in 1939 at a dance at the Jubilee Hall. Describes how he came from Leiston. Describes how they got engaged on Doris' 21st Birthday and that the ring was very special as it had three crowns on it. (The ring has since been given to Doris' daughter who lives in Scotland). Describes her wedding day as being the same day as George V coronation and they had a party in the gym. Describes how she left Belstead School and moved into 4 Park Road, Cedar Cottage, the Black Horse public house being on the corner. Describes her husband as being an insurance agent in Aldeburgh, having previously worked at the International Stores before they were married. Describes how he worked all hours and used to cycle over to Westleton to collect the insurance payments working a 5 day week. Track 3. [9 min] Doris describes how she did not really work again but ran a bed and breakfast, with cooked lunch and evening meal. Describes how she was evacuated while she was having her son but it was only for a few weeks and she returned to Aldeburgh. Describes the bombing in Aldeburgh and the Post Office being hit. Describes how her husband was riding his bike when a plane came over and he jumped off the bike and laid down in the road. Describes how her husband then got a job working in the telephone exchange in Aldeburgh, which she believes was near the Brudenell. Describes how her husband was called up in 1942 and went to Germany and she did not see him for a while. Describes how he came home on leave and her daughter was born in 1944. Describes how when he came home from the war he tried to get his insurance job back but the book had been split into two people and it wasn't worth it, so he got a job back at the International Stores. Describes how later he got a job managing a small grocers. Doris describes that she used to make cakes for sale in the shop and later a restaurant. Describes how the restaurant (now the Lighthouse) was owned by the Mrs. Reade and Doris's husband was asked to run that as well. Describes how they gave up the restaurant up in 1954 but kept the shop. Describes how they retired in 1963 when VAT came out. Describes how they lived for a couple of years on their takings from the shop. Track 4. [7 mins] Describes how they moved to 17 Fawcett Road, and then Linden Road. Describes how they lived in a bungalow at Silver Drive for 10 years and Doris has been at her present address for 12 years. 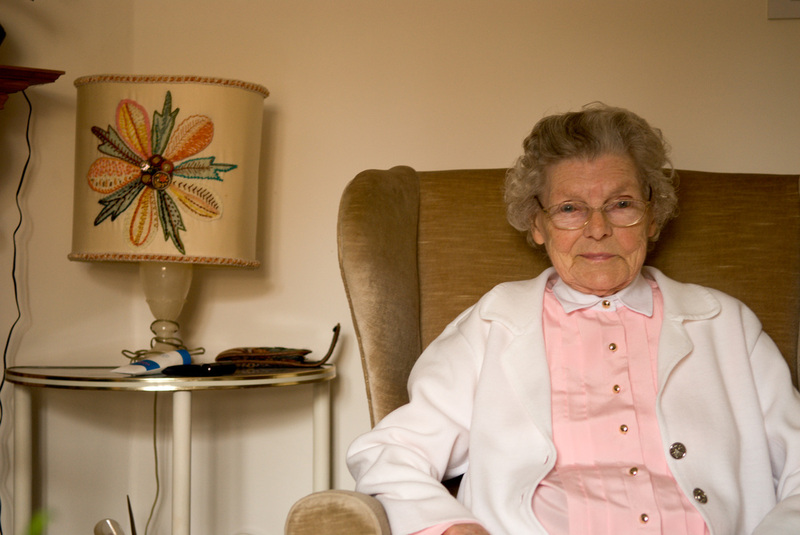 Doris describes how she used to make cakes for Benjamin Britten, one every year he came down. Describes how BB housekeeper used to shop and their grocers. Describes some of the cakes she made, one being shaped like a basket with marzipan roses. Describes how she met the Countess of Harwood who played the piano in the orchestra and whose rather made pianos. Describes how BB invited them and all the trades people in Aldeburgh for an 'At Home' party. Describes how he had a lamp on his piano, the lamp being a brandy bottle with labels of all the places he had been. Describes how she thought that was a good idea and made herself a couple of lamps after going to evening classes to learn how. Describes how BB wrote Let's Make and Opera and she made him a cake, and as decoration managed to buy a very small white piano to go on the cake and she also iced some musical notes. Describes how BB drove her daughter to the fair when she was carnival queen in the early 60's. The recording then stops.